Good morning to you! Exactly one week until Christmas... squee! I was thinking of breaking up the Christmas baking posts here with something different (a restaurant post, perhaps, or a book review), but then thought better of it. More Christmas baking! More, I say! Hang those who talk of less! About this time every year, I suddenly panic and think I should bake some gingerbread, and then look through all my Nigella books to compare all the different recipes and try to decide which one to bake. Nigella has a real way with gingerbread, and she's got so many recipes for it, all of which look very tempting. The subtle differences - treacle or golden syrup? Fresh ginger added? Chocolate chips? A lemony glaze? I get paralysed with indecision! (I see that trying to choose between different Nigella recipes for the same food is a uniquely "Sarah" problem - so forgive my blabbing on about it). Perhaps one day I'll bake them all and do a side-by-side comparison. Can you imagine! For future reference, (i.e. when next Christmas comes around and I'm frantically comparing gingerbread recipes), let me remind myself that I love the stem-ginger gingerbread from How to Eat, and that last year's efforts of Nigella's sticky gingerbread (from Nigella Christmas) were also rapturously received. 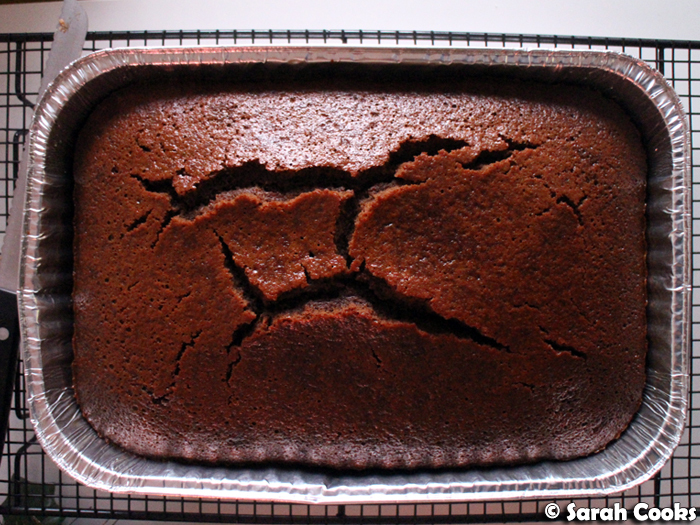 Today's gingerbread, however, is a little riff on Nigella's Guinness Gingerbread, which comes from Kitchen, and is also highly recommended by my friend Clarice (baker extraordinaire and fellow Nigella-obsessive!) 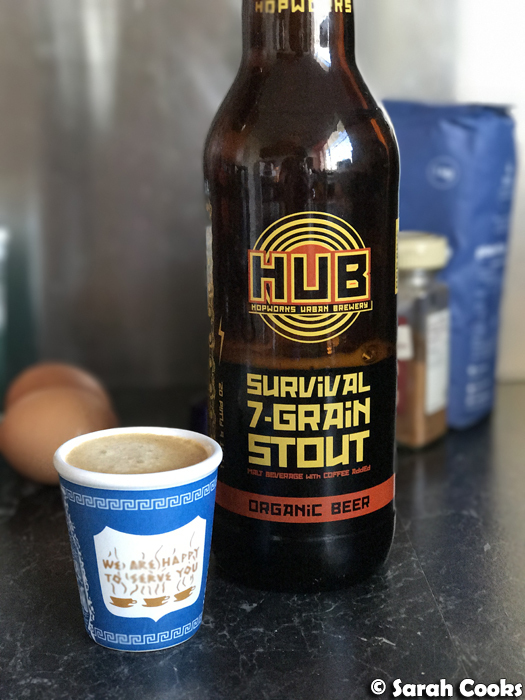 Some months back, I'd bought a hipster coffee-infused stout (seven ancient grains and organic coffee), and never got around to drinking it. 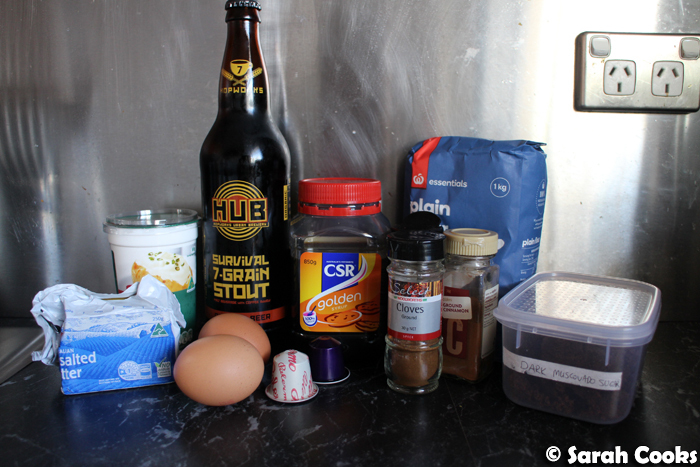 I thought that a malty drink, with the added power of coffee, would be perfect in a rich, spicy gingerbread. I also added a shot of espresso to the batter because coffee is life. Look at all those ingredients! So rich, such aroma. By the way, I love using dark muscovado sugar in baking - not only does it give baked goods such a lovely treacly flavour, but it adds a great fudgy texture. The gingerbread contains a generous amount of spices - two teaspoons each of dried ginger and cinnamon, and a quarter teaspoon of cloves. The house smelled so Christmassy and welcoming as this was baking! For funsies, and to make sure the coffee taste really came through, I added a coffee glaze after it was baked - icing sugar, butter, cocoa powder, espresso and a little more of that coffee stout. To be safe, I reduced the sugar in the actual gingerbread, to make sure it didn't go OTT sweet once the glaze was poured over. Boy howdy, this was some good gingerbead! 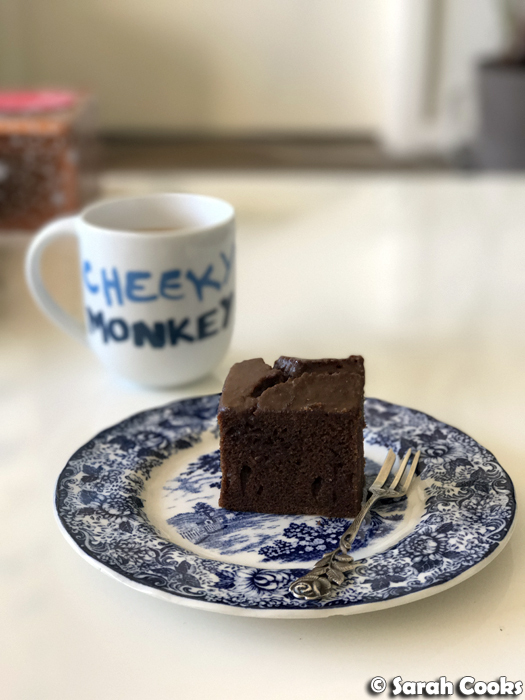 It was so moist and tender, and I thought the coffee glaze worked so well, with the fresh espresso cutting through the sweetness of the gingerbread, but also enhancing the dark and spicy flavours. The glaze is quite thin (add more sugar or use less liquid if you prefer a more spreadable icing), but I loved the light crackly-crunchy texture it added to the top of the gingerbread, not to mention the added moistness. 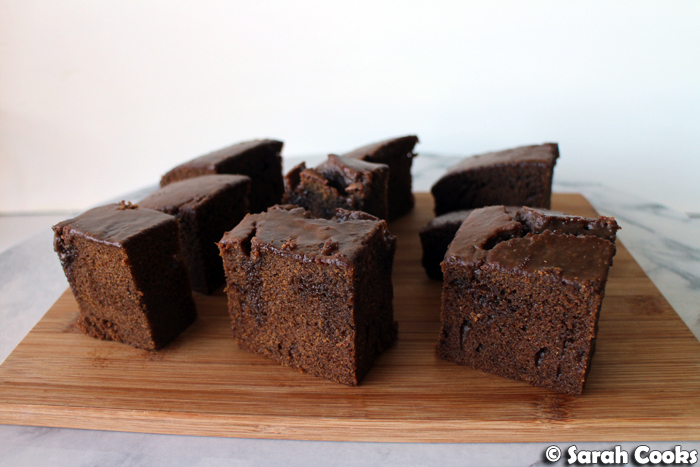 This is serious gingerbread - definitely one for grownups and coffee lovers. Enjoy! Preheat the oven to 170C. Line a 30 x 20 x 5cm baking tray with baking paper. (If you're using a foil tray, grease it with butter). Place the butter, golden syrup, dark muscovado sugar, coffee stout, espresso, ginger, cinnamon and cloves in a saucepan and melt gently over a low heat, whisking to combine well. Take off the heat, and sieve in the flour and bicarbonate of soda. Whisk gently to combine, making sure you get all of the lumps. Whisk the sour cream and eggs together in a separate bowl, and then beat into the gingerbread mixture. Pour the mixture into the prepared tray, and bake for about 45 minutes, or until a cake skewer comes out with just a few moist crumbs. Allow to cool in the tin before icing it. To make the glaze, sieve the icing sugar and set aside. 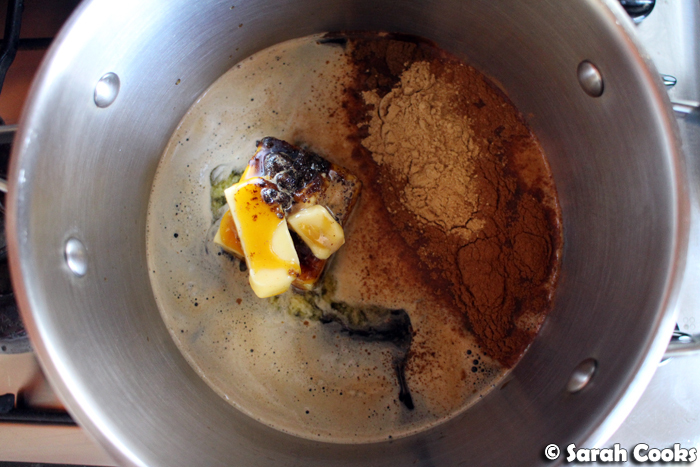 Place the butter, cocoa, espresso and coffee stout in a saucepan over a low heat until the butter is melted. Take off the heat and whisk in the icing sugar. Pour over the glaze, (you may not need all of it, just pour and spread it until the gingerbread is covered), and cut into slices once it's set. I haven't cooked a Nigella recipe for years! I'm not sure why but this one does look good. You've made it sound absolutely delicious. Oh my lord this is right up my alley! Love the idea of adding coffee to gingerbread. And stout!